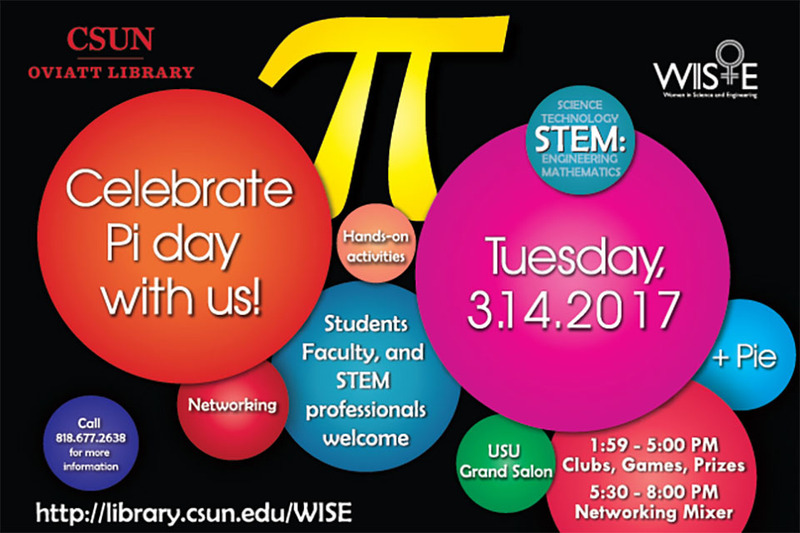 The Delmar T. Oviatt Library and the Bonita J. Campbell Endowment for Women in Science and Engineering (WISE) are teaming up once again to bring California State University, Northridge a two-part Pi Day celebration. The event will be held on March 14, from 1:59 to 8 p.m. in the University Student Union’s Grand Salon. Evans also said she and WISE hope the event inspires students to consider careers in science, technology, engineering and math (STEM). “We hope this year’s Pi Day encourages students to pursue careers in science, technology, engineering and math, especially underrepresented students, like women and minorities,” Evans said. The clubs, games, prizes and pie/pi portion of the event will be from 1:59 to 5 p.m. The reason for the unique start time is pi-related. Pi’s first six digits are 3.14159… Some of the clubs expected to attend include the Math Club, CSUN Matabots and CSUN Women in Science. The second part of the event is the Networking Mixer. The mixer will be from 5:30 to 8 p.m. Evans emphasized that this mixer is an opportunity for students to talk to STEM professionals and educators. “The STEM professionals who will attend this event look forward and are eager to get to know CSUN students, so students shouldn’t be shy. They should approach professionals they want to talk to,” Evans said. Event organizers request reservations by Wednesday, March 8. Reservations can be made by contacting Alexandria Chavez at (818) 677-2638 or by emailing wise@csun.edu. This event is open to the public and free of charge. Free parking is provided for the first 50 reservations. Guests who register in time to receive free parking will be able to pick up their parking pass on Tuesday, March 7 at the the Library Administration front desk, which is located on the third floor of the Oviatt Library. For additional information call (818) 677-2638 or visit http://library.csun.edu/WISE.